Farmhouse with heated swimming pool in peaceful rural location. The property is over 300 hundred years old and has a large garden, and the house itself has beams throughout. The garden has a covered decking area for outside eating and your own barbecue, and sun loungers, Games for the garden. Plenty of parking space. Gravel courtyard which has a second seating area which is also covered. Welcome pack. Above ground swimming pool. Two double bedrooms and another double with two single beds. We are a sociable couple who enjoy travel, both abroad and at home, walking our dogs, cycling, visiting markets, visiting sites of historical or natural interest, eating out and the fine wines of France. Over the years, we have stayed in many self-catering properties; our experiences have given us high expectations of holiday homes, which are reflected in Honeysuckle Cottage. Until recently, we both worked in education, Nick as a Secondary Headteacher and Pip as an English and Drama teacher. We both enjoyed our careers and are now looking forward to a different pace of life. As the new owners, we are always open to suggestions on how we can improve your holiday! We bought the property which is a 300 year old stone farmhouse to semi-retire in a beautiful, tranquil location. There are many places to visit, places to cycle and walk, good shops, markets and restaurants. The house is in a little village with good access to a variety of places of interest and beaches. 30 min from Mont St Michel. The property benefits from being spacious, characterful and in a peaceful setting surrounded by beautiful countryside, whilst having all of the advantages of a larger town 10 minutes away. The property is in a small hamlet consisting of 3 houses. There is a shop/bar/restaurant and a 12th century church approximately 1km away. There are lovely walks from the village. Shower, toilet and hand basin, heated towel rail, wall-cabinet, floor-cabinet and mirror. By arrangement with owners at a cost. Bath, hand and pool towels provided. Cross trainer and exercise bike available. Oak beams, large granite fire place with log burning fire. Wood flooring. Two, three seater sofas , large dining table, six chairs, tv, DVD library. Selection of board games. Gas hob/oven, fridge with small freezer compartment, microwave, toaster, kettle, iron, ironing board, all cooking utensils, saucepans etc. In-door games and out-door games. A distance of approx 35 kms fishing 15 min away cycling tracks and paths for walking , can arrange cycle hire. can arrange horse-riding from local-chateau. Notes on accommodation: Changeover day Sat to Sat preferred Arrival time 3pm Departure 10am Outside: Covered decking area with table and 6 chairs, barbecue, sun loungers, another small covered area with table and chairs, parking area for up to 3 cars, outdoor games, badminton, etc. above swimming-pool. dart board, . Utility Room: Washing machine can be used at small additional cost. Cleaning / Towels / Linen / Maid service: Linen, towels included replaced once a week, cleaned when vacant, beach towels not included. Other: Upstairs landing with sideboard and seating area. leaflets of places to go and of interest. We really enjoyed our stay at Honeysuckle Cottage. Pip and Nick were the perfect hosts and we really appreciated our welcome pack on arrival. 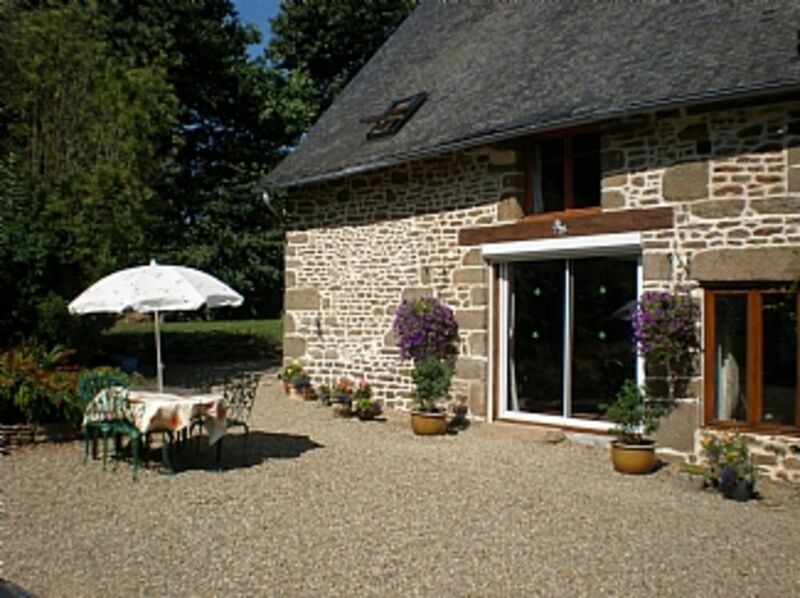 The gite itself is set in a beautiful, rural location, in a massive garden with picturesque views. It contains everything you could need and has been set up with a real attention to detail. The cleanliness was spotless, the beds so comfortable and the towels fantastically soft. Lots of thoughtful touches, like the DVD collection that we all enjoyed. Have stayed in many gites over the years and this was the best to-date. Would highly recommend. We are so glad that you had such a lovely time and look forward to seeing you again. Excellent stay - spotless, and very comfortable. The welcome pack was just what we needed after arriving late at night. A beautiful location, in the country - stars were breathtaking. Beautiful local villages, plenty to see and do for foodies / history / nature / / architecture / military history buffs...plus the pool! Nick & Pip fabulous hosts - very welcoming and nothing too much trouble. Thoroughly recommend and will certainly stay again! Many thanks for such kind words and we look forward to seeing you again. As soon as we arrived, we felt like we were at home. Pip and nick were very welcoming and very helpful. They provided us with a starter kit, containing biscuits and all the essentials ( Brilliant for after a drive!!!! ) as well as setting up a log wood fire for when we arrived. For our week stay we travelled all around Normandy, visiting sites such as the Bayeux Tapestry Museum, D-day beaches, Deauville, the Arromanches and Mont Saint-Michel. Pip and nick personally helped us choose where we should visit, recommending sites based off their experience. Thank you once again, Pip and Nick; we had a fantastic time. We are so glad you had a lovely time and hope that you will return at some point. Fantastic, lovely stay in a beautiful gite! My stay in this wonderful gite was dreamlike and massively enjoyable, for many reasons. Firstly, hosts Pip and Nick were really friendly and very helpful. Always up for a chat and a drink, they were incredibly welcoming and brilliant hosts. As well as this, the gite I stayed in was in an impeccable condition, being incredibly clean and very cosy, again contributing to the amazing stay! Finally, the location of the gite was excellent, being in rural France whilst also being close to some pretty villages and towns nearby, perfect for exploration. I would like to thank Pip and Nick for their friendliness and would recommend anyone looking for a holiday in France to enjoy the same incredible holiday that I experienced. Many thanks for such a fantastic review, we hope to see you again soon. Lovely,clean and well equipped Gite. We very much enjoyed our stay in the property.The gardens and Gite are lovely and Nic and Pip went out of their way to make us welcome as they were close by.We also loved Alfie and Gracie who visited us .A car is essential for this area as it is a very rural location.We did think we could walk to the nearby village or commune as it is known ;Monthault but when we went there on several occasions the shop/restaurant / bar (the same building!) was always shut,this was one of our criteria when booking a property to be able to walk to some amenities nearby. Maybe Nic and Pip may be able to liaise with the shop/restaraunt owner to ascertain opening hours.Having said that there is plenty to do within driving distance,Dinan is lovely , the Gardens in Fougeres and the St Hilaire Wednesday market were highlights also. In conclusion a holiday in Honeysuckle cottage, I can thoroughly recommend as its peaceful and relaxing. We are so glad you enjoyed your stay, we have since found out that the owner of the Auberge de Rocher in the village was herself away on her holiday! We had a relaxing week in a peaceful country setting. The cottage is extremely comfortable and well-equipped, with excellent facilities for children including a great pool, which looks out on the pretty French countryside. There are plenty of lovely sandy beaches within easy driving distance, and interesting local towns to visit. Our children (ages 7 and 9) particularly enjoyed the local theme park Ange Michel (15 mins drive). The hosts, Pip and Nick, made us very welcome and we were most grateful for the welcome pack on the first evening which included local cider, wine, bread, milk, jam and biscuits. We would definitely recommend staying at Honeysuckle Cottage. It was an absolute pleasure having Eve, Keith and the children stay in the gite and we are so pleased you enjoyed the holiday. Mont Saint Michel is 35 mins driving. ST Malo 55 mins driving from St Malo you can get a ferry to Guernsey or Jersey. Small local beaches 40 mins drive. St Hilaire, 15min, Weds market.